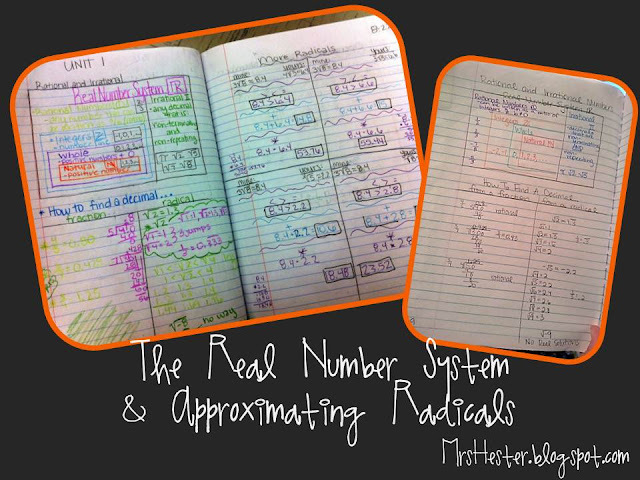 Students were already somewhat familiar with the idea of rational and irrational numbers. While it had been a year and the concepts were definitely fuzzy, they had a little familiarity with the terms. This was the first year for most of my students using an interactive notebook and they were concerned about writing too big/spacing/logistics. So cute! I put up the following diagram before we got started and eased some of their worries. They felt more confident knowing the layout of the entire page as we filled in portions. In the top rectangular section we completed the Real Number System information. We created nesting rectangles to show which groups were subsets of other groups. I really liked the way the layout created a number line! The students seemed to understand this layout very well. Under that section we discussed how to approximate numbers without using a calculator. Some students panicked, but eventually became confident. Don't get me wrong, this was NOT and overnight transformation! Ha! But with enough encouragement and "put the calculator down!" moments, we all made it through. 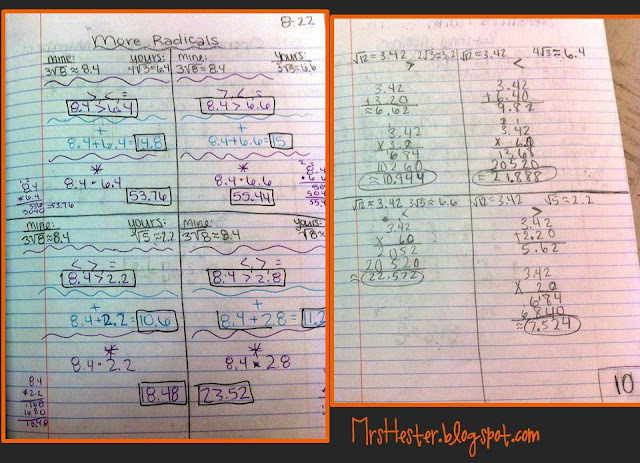 That night students completed a few problems in classifying and approximating numbers. We came back the next day, checked our answers with our cooperative teams, and then did a little Stand Up, Hand Up, Pair Up Kagan activity. 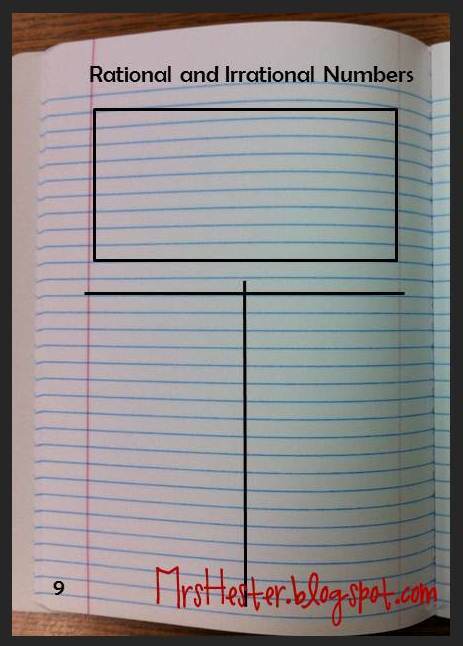 Students all divided the right side of their notebook into quadrants and drew a card with a radical. They worked individually for a few moments to approximate their radical, then they began pairing up. I also had a card and was a member of the activity. I've found that students partner up much more quickly and wander less if there's the impending doom of having to partner with the teacher, especially during the first week of school! Ha! I'm okay with that, whatever it takes. Once students had found they partner, they each worked to approximate the other's radical. 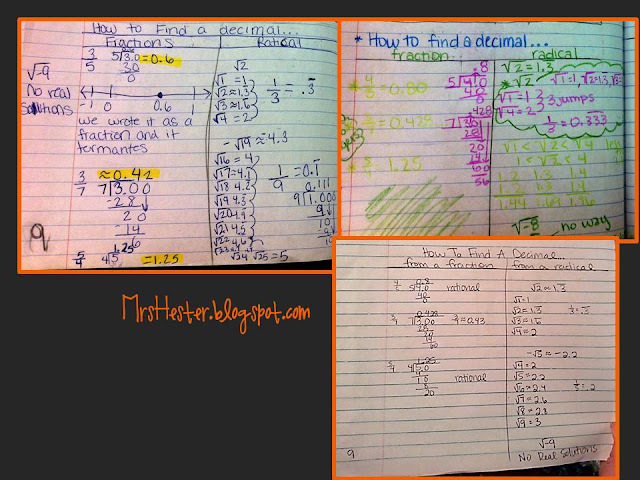 Then they compared their decimals using <,>, or =, added their decimals, and multiplied their decimals. This gave students four different practice opportunities very quickly, as well as the added benefit of meeting their classmates and learning that our classroom is a place of active learning. Success! What ideas do you have for this topic that I could implement next year? Any tips to make these pages better? I'd love to hear from you! !